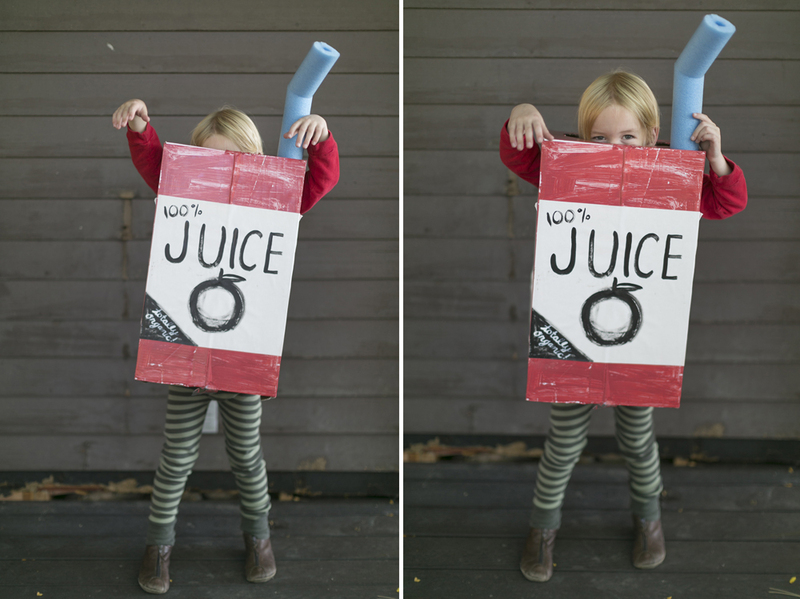 My boy’s initials are AJ and OJ and for the longest time I’ve wanted to make them Apple Juice and Orange Juice box costumes. 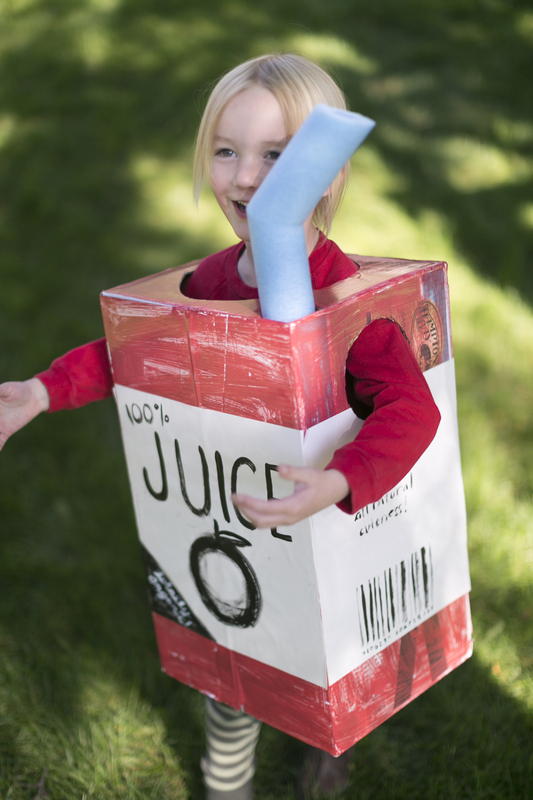 I’m so happy to say that this year I’ve finally made a juice box costume! I love it for the littles but I think it’s totally perfect for older tweens/teens and even adults. 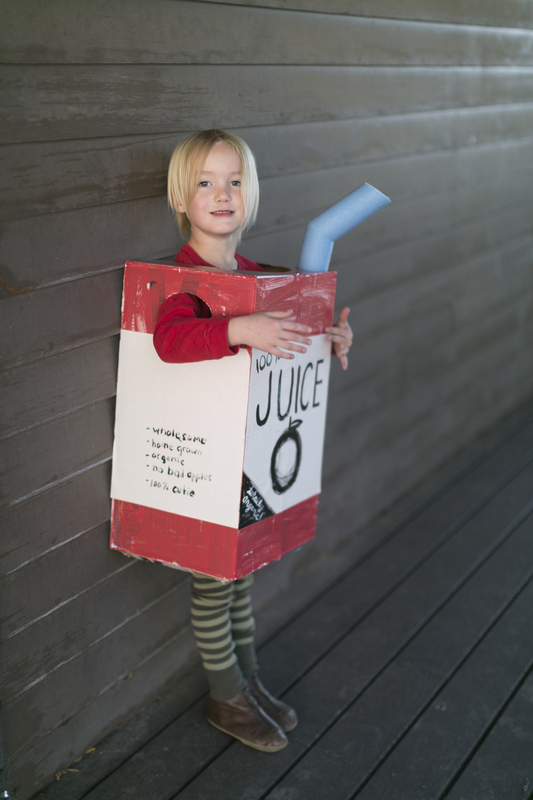 I’m crazy about the idea of of a group getting together and making juice box costumes for a variety of juices – apple, orange, grape, pineapple, etc. 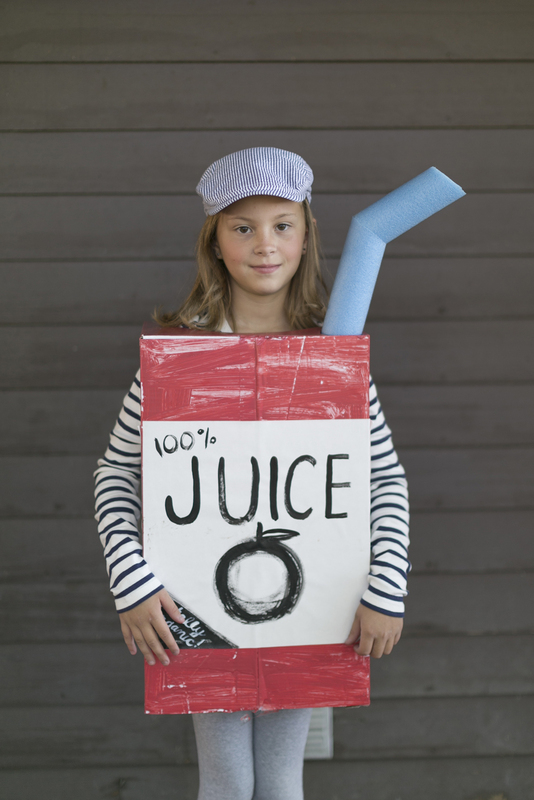 Perfect idea for an enssamble costume choice. Cut out two arm holes. Measure your child for comfort and fit. Measuring the pool noodle, cut a hole in the top of the box for the straw. Make the hole slightly smaller than the noodle for tention. Paint the box with what ever color of juice you are choosing. let dry. 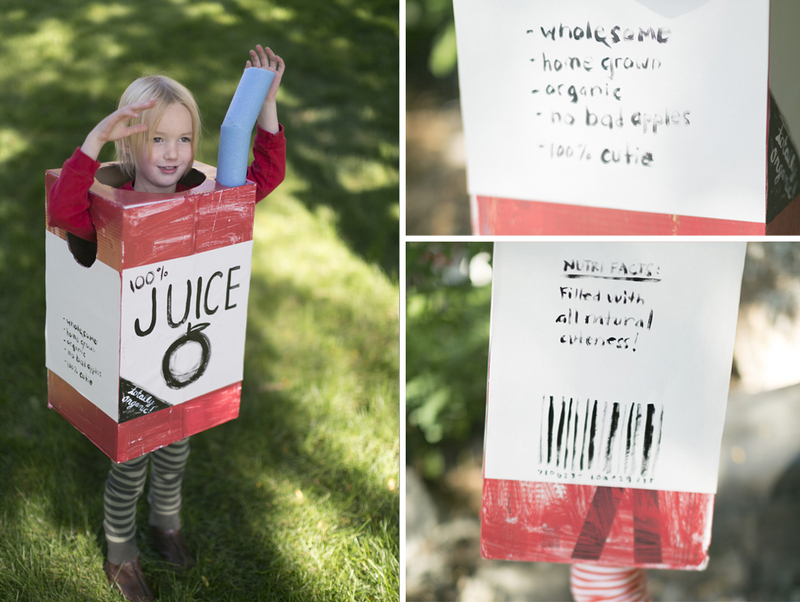 Cut newsprint for your juice label down according to the size of the box. Paint juice box info onto the front and side panels. For our side panels I write ingredients like wholesome, home grown, organic, no bad apples, 100% cutie, filled with all natural cuteness, etc. Using spray glue (or another adheseive) glue down papers to your box. Let dry. For the straw cut down your pool noodle to the height of the straw you’d like. Cut of the top portion at an angle. Pivot the straw and then glue down so that it appears to be a bent straw. Let dry and insert into straw hole in your box. 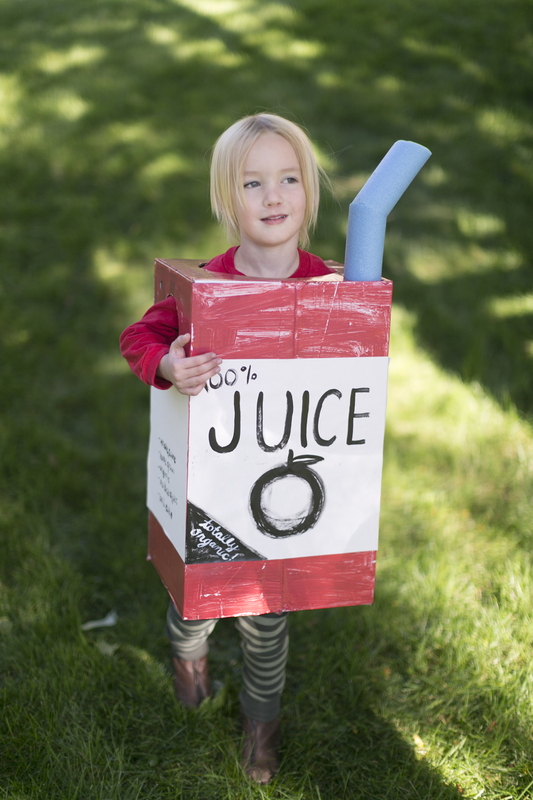 Put your new juice box costume onto your little one and head off and a fun filled trick-or-treating adventure. 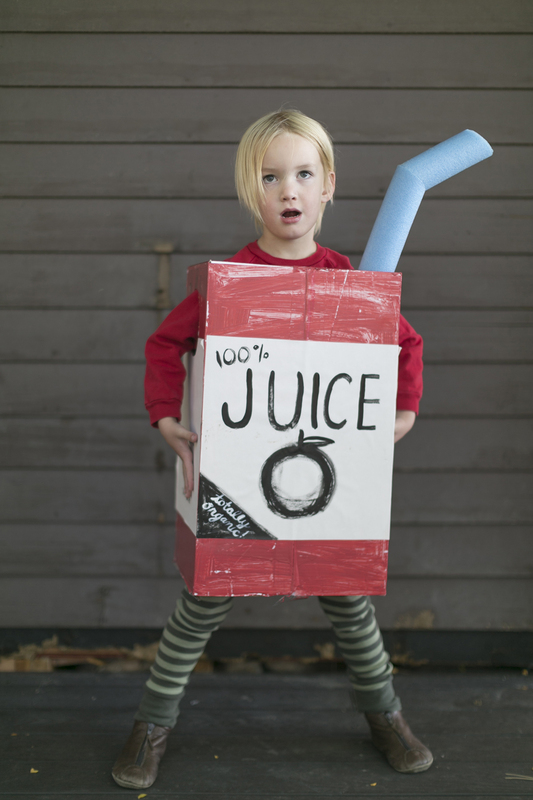 Make more juice box varieties for siblings and friends! A DIY Halloween Craft Bonanza! !